This final installment of my journey through England I’m writing on the early morning train from Plymouth to London. Out the window to my right I can see the thin crescent of a Moon approaching its new cycle, in an elegant line on the ecliptic with Venus, Mars, and Jupiter. The edges of the planetary bodies are crisp and clear in the cool morning air. The sky is slowly lightening, and I will see the sunrise while aboard this train. The pace of going from Canterbury to London, to Cambridge and Oxford, was beginning to wear me out, and I was grateful the latter half of my travels would be spent in more relaxed environs. From out of Oxford I caught the train to Stroud. The last section of the train journey was especially beautiful, as we raced past a steep, green valley whose hillsides were embedded with old stone houses and churches, flower and vegetable gardens terraced directly into the slopes. The images flashed past before I could fully take them in, a brief glimpse into a world I could only imagine what it must be like to be a part of. I was met at the train station by a dear family friend, who brought me to a local pub where we met up with his son, another friend of mine. The Woolspack is no ordinary pub. Like the village I had seen on my train journey, this pub is part of a small hillside community, the buildings constructed of old grey stone, gardens overflowing with flowers in every direction one might look. The pub itself looks over a deep green valley, with nothing but pastures and trees covering the facing hillside. We sat out on the stone patio amongst the trailing vines and blossoms. First to arrive at lunchtime it was perfectly quiet. No breeze stirred the air, and one could almost feel the movement of the warm lemon sunbeams in the stillness. As our meal progressed—pints and jerusalem artichoke, cheese and hazelnuts, followed by a tray of coffees and an assortment of puddings—other families and couples and groups of friends settled in around us. But all maintained the reverent quiet of the still air and the warm October sunshine. Our conversation, seemingly inevitable in this setting, turned to fairies. This is the part of England where everyone knows there are fairies present. 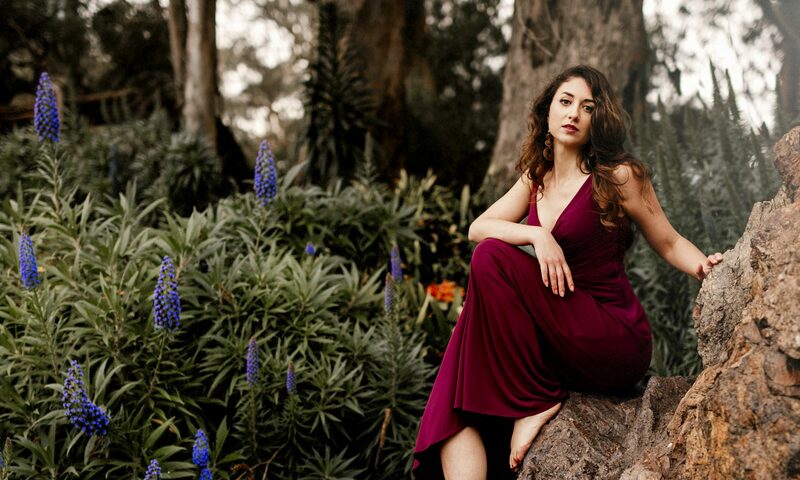 What if one were to write not a fairy-tale told by humans, but a human-tale told by fairies? What would they think of us? As we spoke I realized that the little girl at the table next to us was holding a conversation not dissimilar to ours: ‘But it was a real fairy! Why doesn’t she understand that I saw one?” the young lady asked. 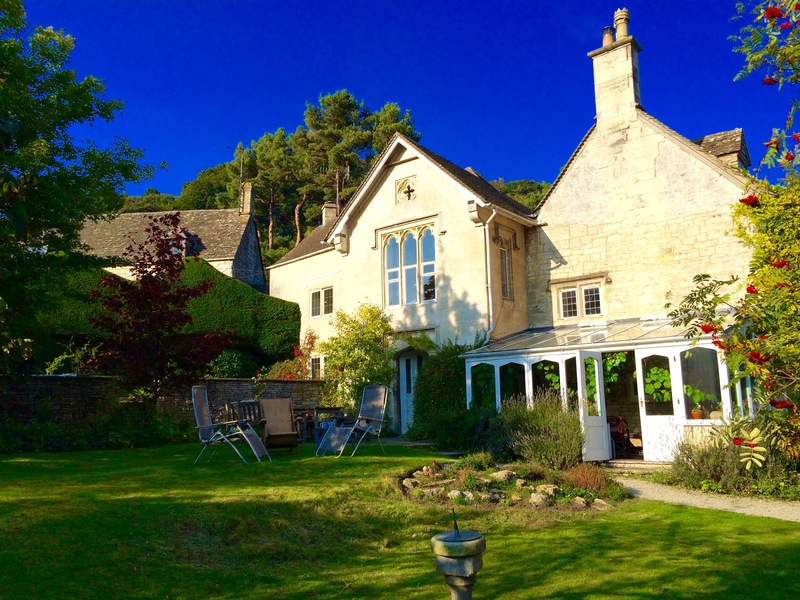 Our meal concluded, we went on to The Grange, their family home in Sheepscombe. 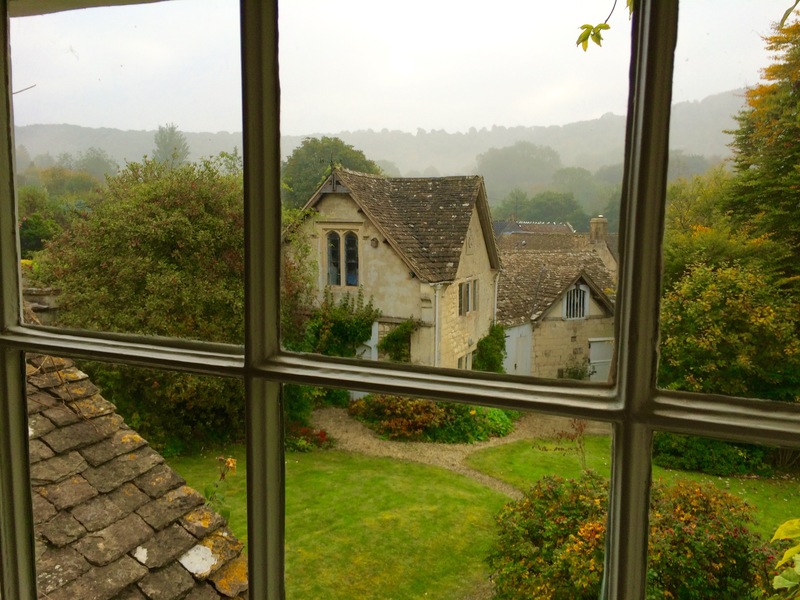 The village of Sheepscombe is also nestled in one of these wooded valleys, a collection of old stone houses, a single church still well attended on Sundays, a little post office and nearby pub, and many trails through the woods and hills in every direction. The Grange itself is an old house, once two separate buildings several centuries old, joined together by a third that was constructed in the 19th century. Lawns and gardens spread around it, a multitude of flowers and fruit trees thriving in the moist climate. There was quince and apple, and the vegetable gardens had the last of the raspberries and sweet peas. A towering beech stands majestically over the yard, its roots clothed in a spray of cyclamen, the enchanted little flower I keep encountering again and again during these travels. Perhaps my favorite part of the whole place was the study. At the front of the house is a glass sunroom, with desk and chairs and a wicker chaise. Growing inside the glass walls is a massive grape vine, trailing and twisting about the room, heavy with deep purple fruit. 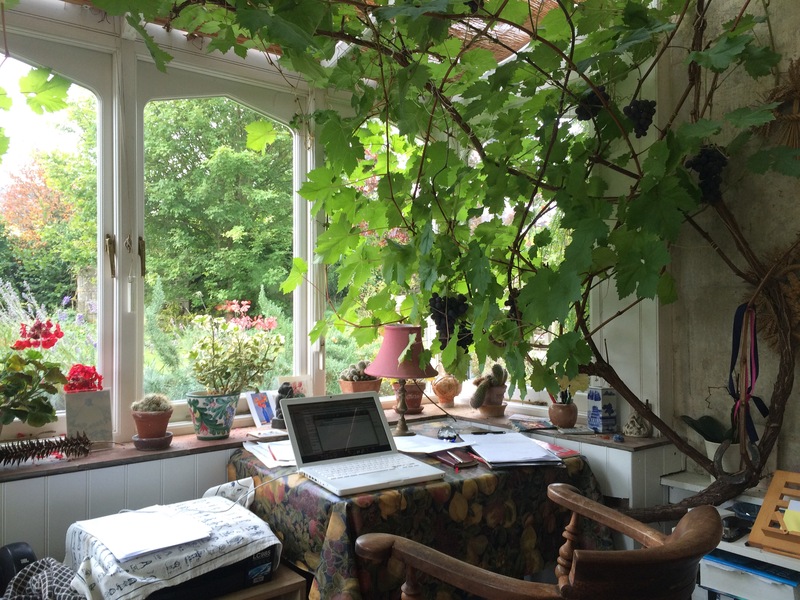 One can sit at the desk working with a cluster of grapes of mythic proportion dangling within reach, just inches from the little desk lamp. We went for a short walk not long before sunset, under the wide leaves of the deciduous forest near the house, and up onto a ridge above the village. As the Sun and horizon neared one another a misty golden glow washed over everything. In the distance a narrow steeple stood up against the light, the church from a neighboring village. Our evening in was wonderfully relaxing, dinner and conversation, and later reading by a warm sitting room fire. Built in 1131 by monks of the Cistercian order, Tintern Abbey’s location was chosen for its seclusion. The monks were largely self-sufficient, living off the land growing food and raising pasture animals. When King Henry VIII defied Rome and founded the Anglican Church, he abolished the many abbeys across Britain and took their wealth for his own. Now all that remains of this majestic place of worship are arched stone walls, ornately shaped where windows once spanned, and in some places nothing more than a pile of reddish stone and the outlines of foundations. Flocks of crows now make their home among the stones, creating a constant call and response as they wheel through the empty windows. Looking up I saw a lone white dove wing from an empty rose window to an open mossy ledge. The floor is now carpeted in soft green grass. There is no shelter from the wind. Following a warming bowl of sweet potato and cauliflower soup along with a half pint, we left Tintern behind us and wended through the hedge lanes a little deeper into Wales. Although much like England, there is still a tangible difference to the feeling of Wales. Green pastures and hills, forests and meanderings streams they have in common, but there is a quality in the air that is different. It feels quieter, less inhabited, suffused with a more ancient presence. Story feels like it is living in the land here. The names on the map roll off the tongue and change the quality of one’s consciousness in the speaking. 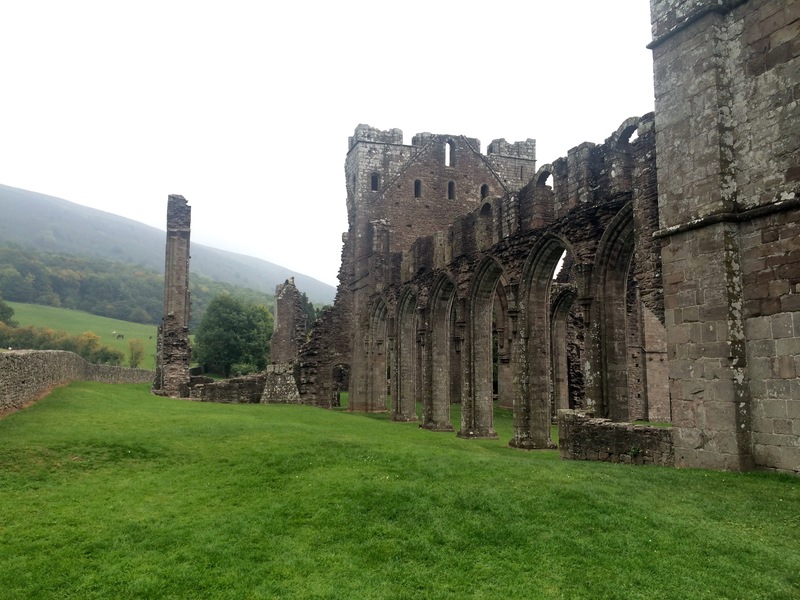 Our route led us to Llanthony Priory, another ruin decimated by Henry VIII. 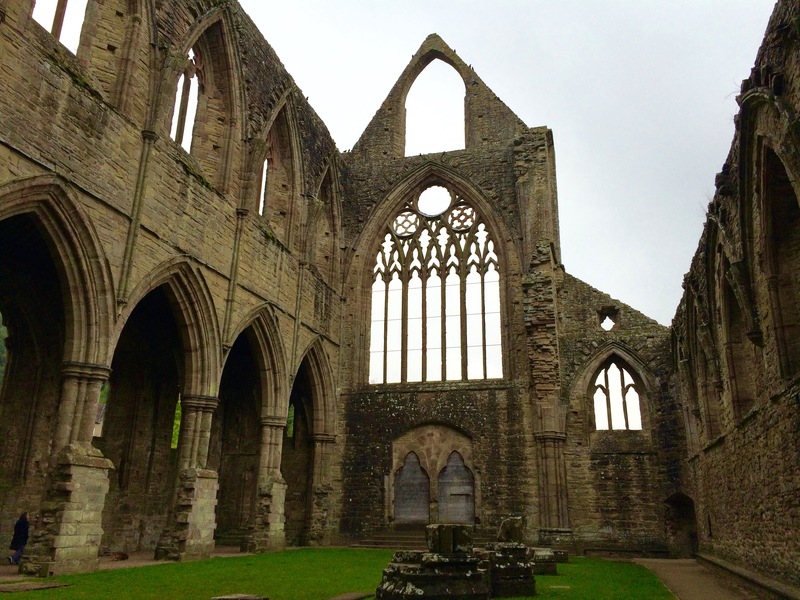 Much less of it remains than at Tintern, and the priory seemed likely to have been more modest to begin with as well. Yet I actually found this place more compelling. 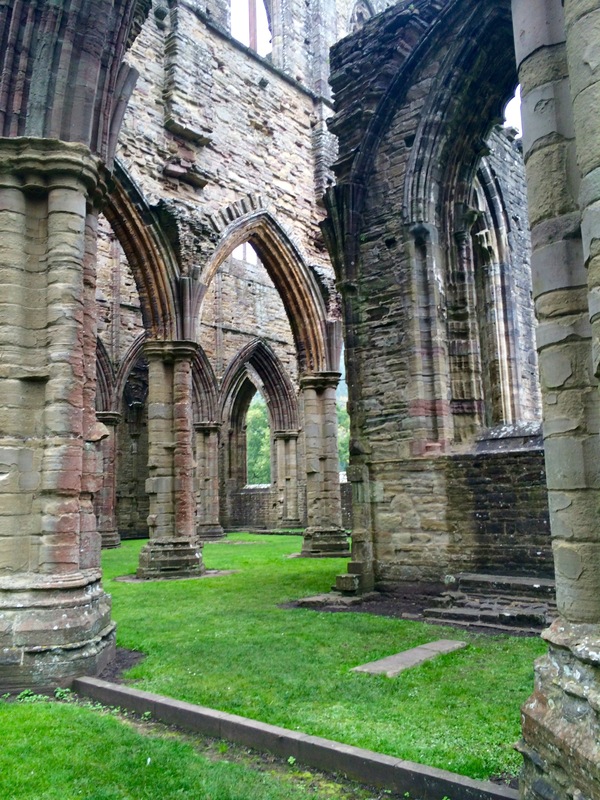 Its arches and remaining walls, some of which were leaning over, were covered in moss and twisting vines. A long field extended up the hill behind it, dotted with sheep, and met the base of a red cliff descending down from the hilltop. The Welsh rocks are red, as can be seen on the cliff faces and in the stones in the ruins. Mist poured down over the slopes. A group of walkers had stopped by for hot coffee at the little hotel set up inside what remained standing of the priory. I imagined coming back here at some future time for a walking tour, spending the days outside tramping across the hills and fields, spending the nights in the pubs and inns that still dot the countryside. Another cozy fire and supper back in Sheepscombe, and a brief stop over at the neighbors’ to see England’s rugby team knocked out of the World Cup by Australia, and my stay in this corner of England had come and gone. Morning saw me at the train station in Stroud again, speeding past that same stone village built into the steep hillside. Now my train, the longest journey yet, led south and further south after that. Much of the way I had my nose in a book, glancing up now and then to see the changing scenery, although it was still consistently pastures and hedges for much of the ride. But toward the end of the last leg of the trip came a dramatic change. The fields gave way to coastline, first to narrow firths filled with sailboats, little towns visible across the way built right down to the docks at the water’s edge. It was a cold and grey day, the steely sky reflected in the choppy water. Once or twice the train passed a boat that had long ago sprung a leak and was now but a rotting skeleton, the ribs of the hull black against the lapping waves. Turning a corner the view opened out to a vast stretch of ocean, waves crashing against the rocky shore, white gulls wheeling in the spray. The train went into cliff tunnels and back out again, each new view more striking than the last. Soon enough the slowing train pulled into the Totnes station. There on the platform waiting for me were my aunt and uncle, who I haven’t seen since they moved to England nearly five years ago. It was a reunion that has been long overdue. 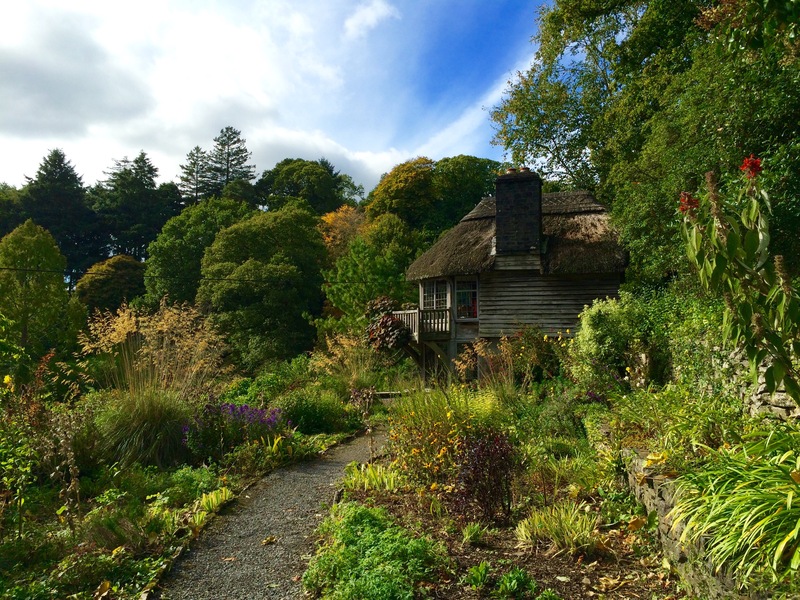 We came back to their home, set among the lovely pastures of a farm just outside of Ivybridge. Inside were so many memorable objects, art and furniture, dishes and decorations, that were so familiar to me from their home in Big Sur, a place that always will be intimately close to my heart. It was strange yet comforting to see them all the way over here in England. We spent our time together walking outside and painting inside, quilling little coils of colored paper into art projects, reading with morning tea and watching movies while cuddling the cat, and simply catching up and sharing meals in each other’s company. 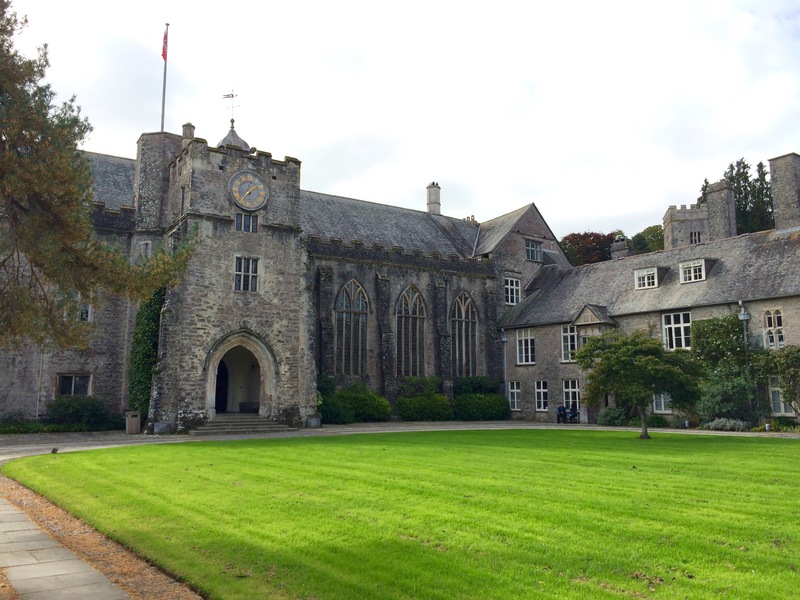 On my last full day we went over to Schumacher College, which I’d always wanted to visit, and walked around the exquisite gardens of Dartington Hall, a magnificent building constructed on the estate initially in the 14th century. 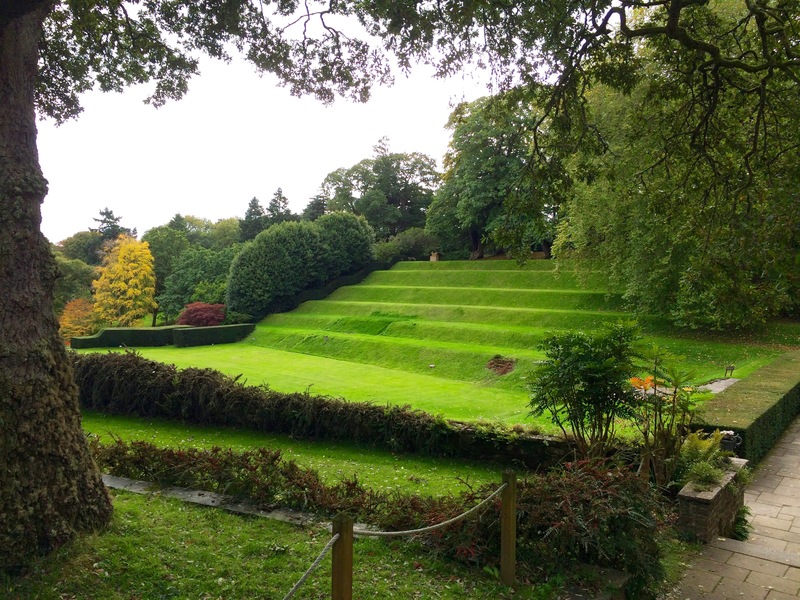 All about the hall are huge tended gardens, ancient trees with lawns running the slopes in between, with fountains and statues and flowers lining the paths and stairways. 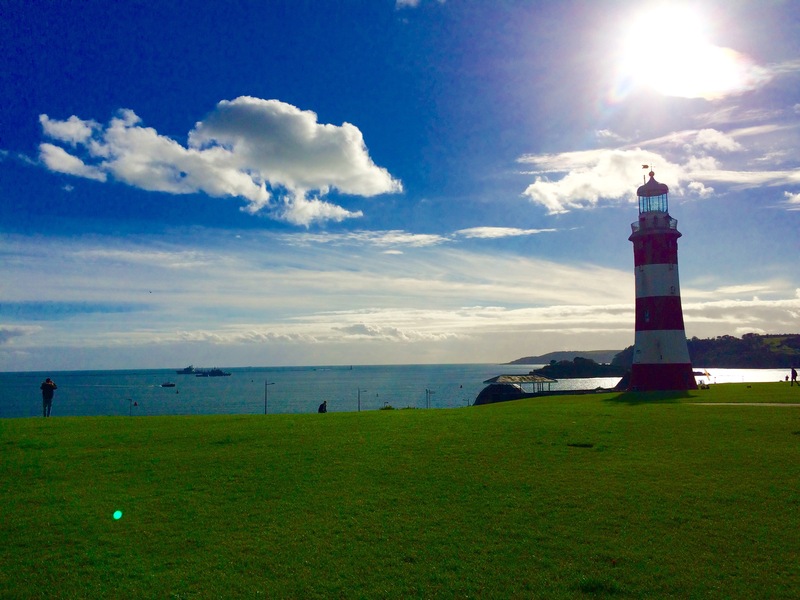 After a thorough wander through the gardens the three of us went down to Plymouth, for a late afternoon walk on Plymouth Hoe overlooking the sea and what was once the primary harbor of the famed British navy. Down at the docks are massive stone buildings that once held supplies for outfitting the ships—ropes and rigging, wood and sails, all fortified against any incoming attack from the sea. Now these buildings largely stand empty, except several on the ground level that have been repurposed into restaurants and cafés. We enjoyed a quiet dinner in one of these restaurants followed by a stroll along the water’s edge. Before long we returned to the quiet of home for a final night together before my departure from England. As I’ve been writing this on the train, mist has been rising from the fields between dark trees and hedgerows. Only the Moon and Venus now remain visible in the periwinkle sky. As more time passes just a thinning crescent can be seen in the rising morning mists. A rich magenta glow now lights the horizon, the dark tops of clouds a heavy violet pushing back against the oncoming sunlight. Sunrise over the calm morning water, first on the straights between the peninsulas, the dark patches visible at low tide contrasting with the colored mirror of the water, and then opening out to the sea itself, a clear pathway of warm sunlight illuminated from the horizon to the shore, where low waves roll against the sand. The train runs along the coast, passing into tunnels cut in the dark rock, then back out again into view of the spectacular scene. No matter how many times I witness the dawn, I will never cease to be in awe.